Because of that, I will no longer be able to update this site or do ANYTHING AT ALL on it. If you are interested in finding out what critters I may "currently" be raising or selling, please EMAIL me and ask. THANK YOU to all my loyal and REPEAT CUSTOMERS through the years. I appreciate you all. I'm sorry I can no longer have a website to make it easy for you to "find" me. This site is under constant construction. Please bookmark and check back here often to see what's new. Thanks. I also raise & sell: Appaloosa Horses, Miniature Appaloosa Horses, Miniature Jersey Cattle, Dexter Cattle, Dexter x Mini Jersey cross cattle, occasionally other Mini or small Cattle, & Milk Stock Goats. I raise and sell ApHC registered Appaloosa's. Many of my Appaloosa's are also registered with the ICAA and the AApA. Several are eligible for FAHR, Sundance 500, and other registries. I concentrate on breeding Appaloosa to Appaloosa and avoiding any/all outcrosses. 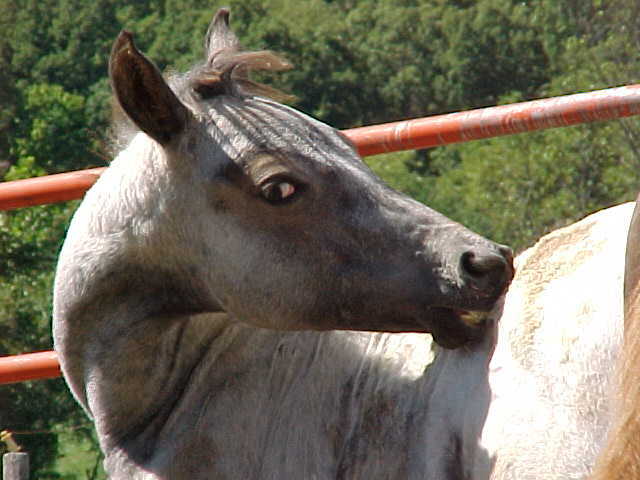 I believe the Appaloosa is a PURE breed and not some "mutt" horse with (or without!) Spots on it. In my breeding program, I don't try to "Follow the Crowd" and only breed the "big names". 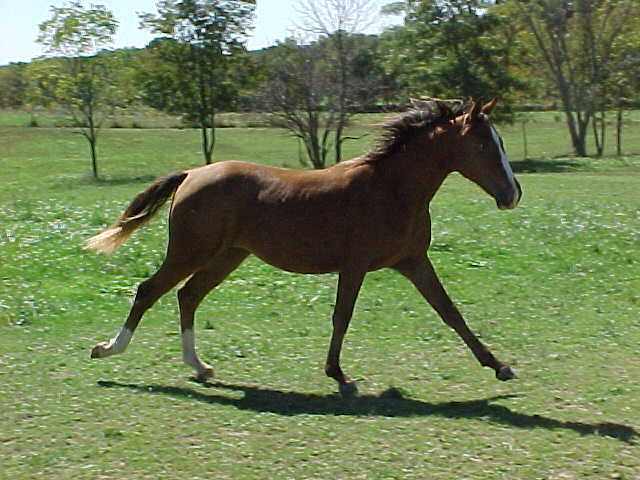 I try to "Follow my Heart" and breed for the HEALTH, sanity, conformation, good hooves, gentleness, color, and the other things that ANY good horse should have! 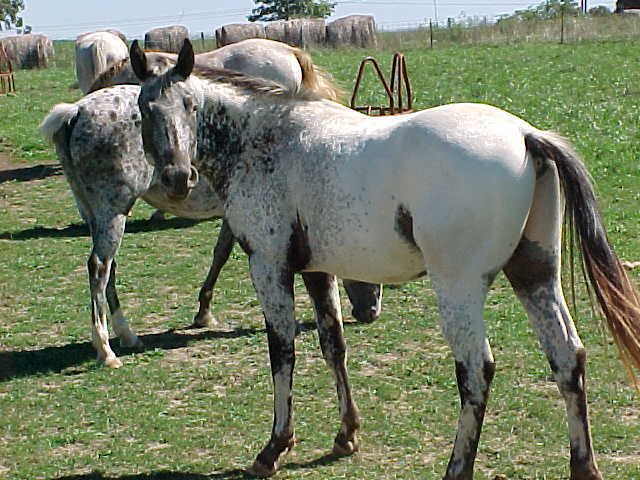 I'll put many pictures and pedigrees on this site, of my Appaloosa's and you can see for yourself the type of Appaloosa's I'm breeding and/or breeding for. Some of the pedigrees will have the "big names" in them. Some will not. However, each and every Appaloosa here is an individual and is it's OWN HORSE, not just a name in a pedigree. They are all gentle, sane, have great hooves, good conformation and are healthy. 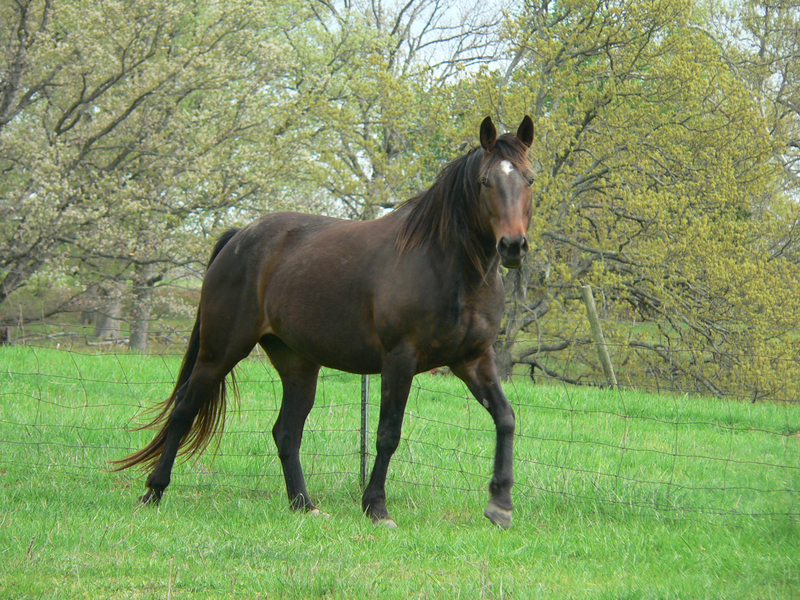 They are raised in a pasture situation, like a horse should be, and my stallions pasture breed my mares, like nature intended. 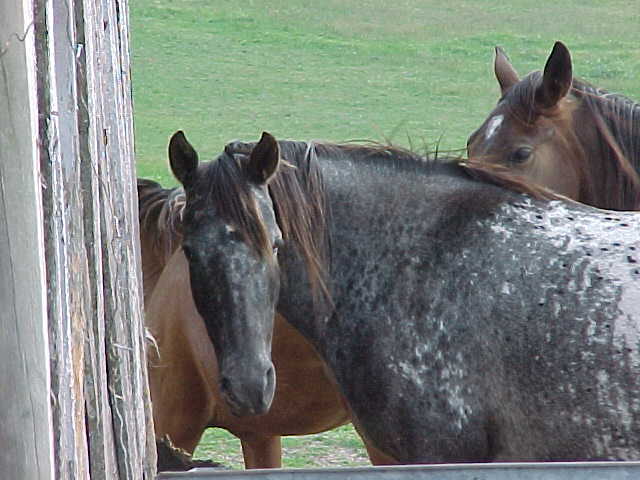 Most of my Appaloosa's are COLORED, tho of course, there will always be a few "bashful" ones who keep their spots on the "inside" and out of sight. But you can still see the Appaloosa in them just by their wonderful temperament! I currently have one Appaloosa who shuffles (does the "Indian Shuffle") and I am trying to get it "bred into" my herd. I love my Appaloosa's and I hope that when you look at these pictures and pedigrees, you will, too! An APPALOOSA can DO it!! Click here for "DelMar Pedigree" site! All of our Horses and Dogs are Permanently Identified with the AVID MICROCHIP. "KRA Top Hand Hope" (filly) scratching! Click picture for bigger view in another window. "Jo" at 2yrs. old. 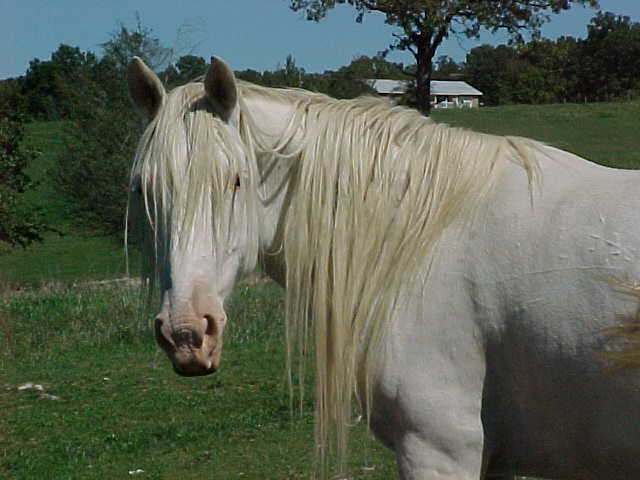 "Jo" is a "SnowCap" Appaloosa stallion. Sweety is a "FewSpot" Appaloosa mare. 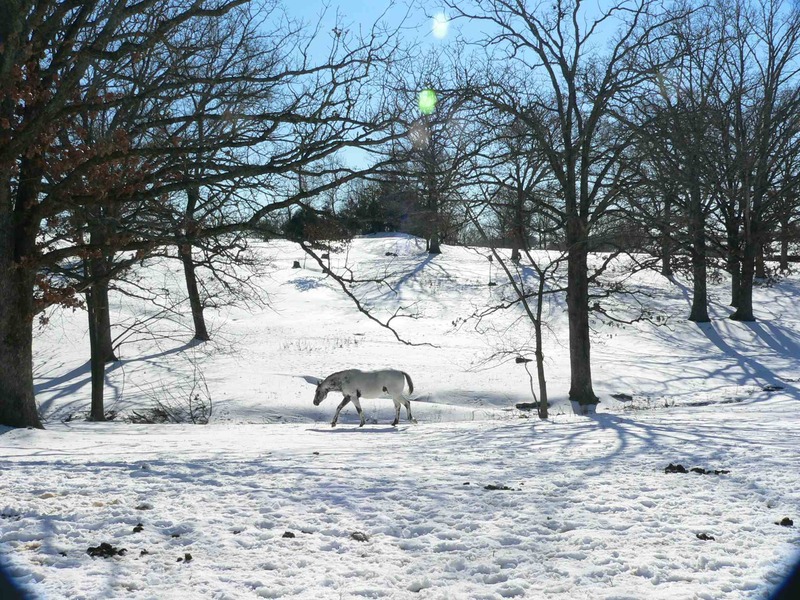 Appaloosa Stallion, "Jo" walking in pasture snow. 12/2006. "Malia" is a granddaughter to my first Appaloosa - "Malia Muncy"
Miniature Jersey X Dexter Cross Cattle. This Site built (on 4 November, 2003) and maintained by "AppyHorsey" (Deloris J. Willis) on my Apple iMAC computer!